Get your bacon out of the refrigerator about half an hour before you want to cook it, this will allow the fat to come a little more to room temperature which will aid the cooking and add to the flavour! You can fry your bacon but if your going to be cooking more than a few rashers its best to grill it, fold some pleats in kitchen foil every inch about an inch high and then lay the bay into the dips of the foil (this will prevent the back sitting in its own juices and will cook quicker). Toast the pitta breads until they start to brown, then cut in half short ways and open up to make a pocket. Drizzle 1 Tbsp of chilli sauce around the rim of each pitta pocket and grind in a little black pepper. 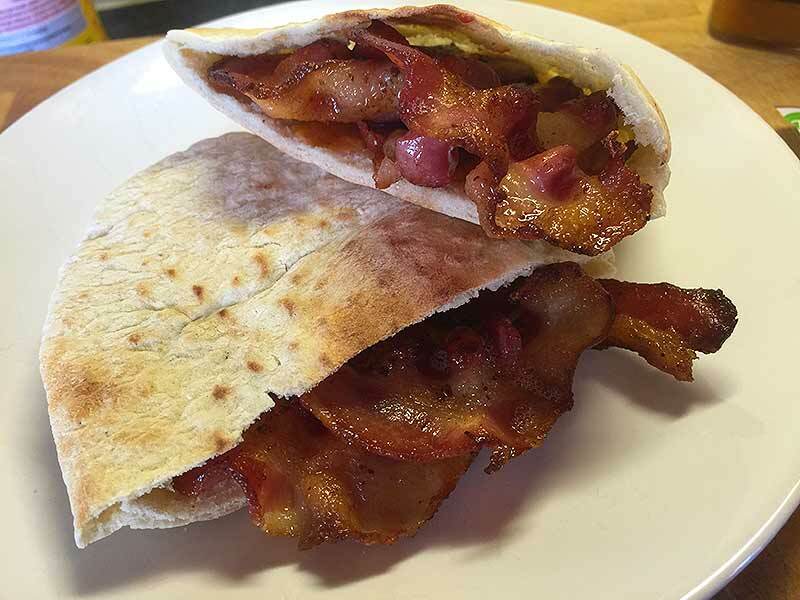 Pack 2 rashers of the bacon into each pitta pocket and eat straight away. If you want make it into a BLT with lettuce and tomato, both options are awesome!